Kenya is holding a meeting of East Africa’s leaders on growing violence in South Sudan, where more than 1,000 people are believed to have died. 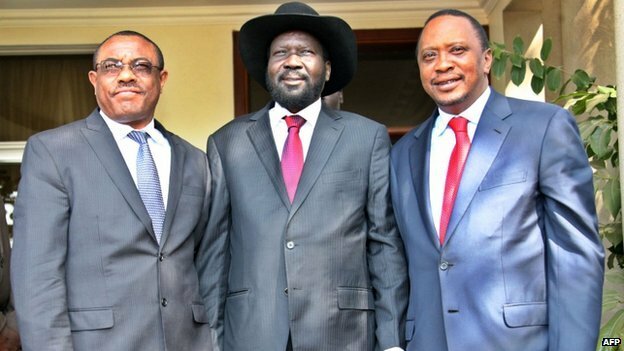 The talks come a day after South Sudan’s President Salva Kiir Mayardit met the Kenyan president and Ethiopian PM. Meanwhile, the UN said the first peacekeeping reinforcements were expected to arrive in 48 hours. South Sudan violence erupted 12 days ago between forces loyal to Salva Kiir and those backing his ex-deputy Riek Machar. The fighting has forced more than 100,000 to flee their homes, with about 60,000 seeking refuge at UN compounds across the country, UN officials say. East African regional leaders from the eight-member bloc, known as IGAD, are meeting in Kenya’s capital Nairobi to follow up on issues raised during Thursday’s talks with President Salva Kiir in South Sudan’s capital Juba. Salva Kiir met Kenya’s President Uhuru Kenyatta and Ethiopian PM Hailemariam Desalegn. The talks were described by Ethiopia as “very constructive and very candid”.